For my last meal in America, my grandpa and I planned to hit up In-N-Out Burger because after 30+ years of living in San Diego, he had never tasted a Double Double! At the last minute, we nixed our burger binge because grandma and cousin Michael wanted to tag along and they weren’t in the mood for las hamburguesas. I’ve reviewed Minh Ky once before, and not much has changed since then. It’s still a fantastic place for noodle soups, especially the mi bo satay, which Michael and I both ordered on this visit. 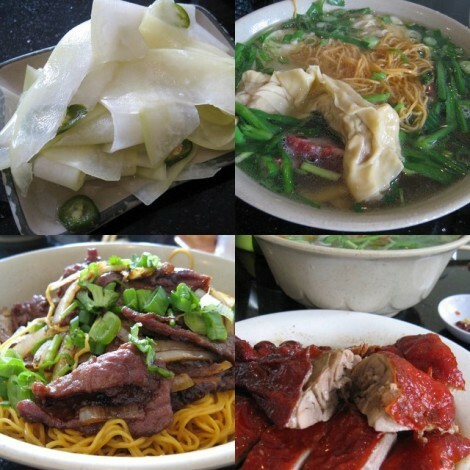 Grandma had the mi xui cao (thin egg noodles in a pork-based broth with wonton-like dumplings), while grandpa ordered the mi vit quay (thin egg noodles in a pork-based broth with a side of barbecued duck). We shared the du du chua (pickled green papaya). I didn’t get to taste any of grandpa’s duck, but it looked damn good from afar. Grandma passed some xui cao my way and they were great; packed with lots of meat and sesame-flavor. The mi bo satay was a bit dry because the ratio of meat to noodles was off. Although I’m not positive, I think the portions at Minh Ky have grown since I visited last summer. In fact, only cousin Michael was able to finish his noodles. Grandma, grandpa and I had to request doggie bags. This portion distortion business has got to stop. oh.. I’ve been there, “Minh Ky”. I like the Banh mi from a corner store close by too. AAhh~ reminds me of my good old days in San Diego. Summer – you must be thinking of A Chau (//gastronomy.wordpress.com/2007/01/02/a-chau/). I love their sandwiches too! More reasons for you to make a trip to SD, right? Nhu – definitely order a bowl the next time you’re in town. Make sure to get it “kho” with the broth on the side. I use to live 1 minute from Minh Ky and 5 mins from Pho Hoa. Man these two places and A Chau were my favorites for asian food. Been eating at these places since the 80s and I love it.